Originally named as Bugho, the town of Carmen in northern Cebu became a municipality on June 16, 1851 through the initiative of Facundo Buot. During the elections held by the Americans in 1899, Fabio Buot was elected municipal president, succeeded in 1906 by Protasio Suico. Fabio Buot again held the town’s top post in 1908, followed by Juan Veloso in 1912 and Hernando Atillo in 1916. The next top executives included Juan de Rallos (1919), Pascual Buot (1922), Apolonio Osmeña (1925),Guillermo Bael (1934), and Elpidio de Dios (1941 up to the late 1960s). Another person who held the mayoral position for a long time, which was 16 years, was Virginio Villamor. He died in 2007. His son, Gerard, was elected mayor in 2013 and 2016. 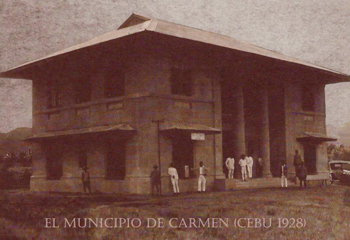 Carmen was the birthplace of Jose Maria Cuenco, the first archbishop of Jaro, Iloilo and brother of former Cebu governor Mariano Jesus Cuenco. Bishop Cuenco founded the ‘El Boletin Catolico,” a Cebu Catholic Newspaper.